Last week I mentioned I was contacted by Foursquare and Bravo TV informing me I had just won a gift for being one of the first 10 Foursquare users to check-in to a bravo tagged venue and unlock the Bravo Newbie Badge. Today I received my gift from Bravo and as promised I thought I would share it with everyone. Prior to receiving the gift, I was under the impression I would be receiving one small gift, but it was actually several gifts. 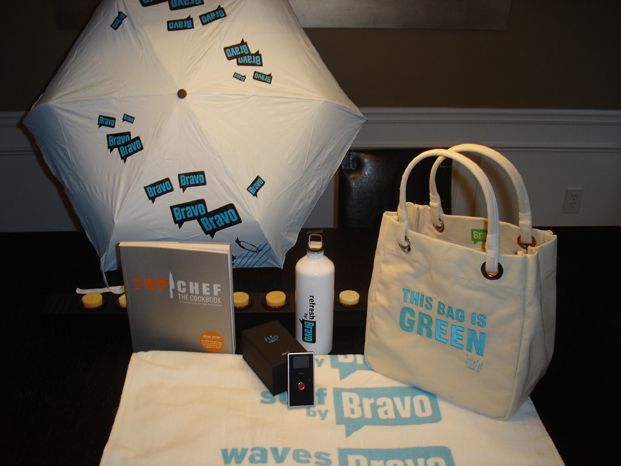 When I opened the large box, the first thing I noticed was a nice size Top Chef Grocery Tote embroidered with “THIS BAG IS GREEN.” At first I thought that was the gift, but as I looked inside the tote I saw several items such as a Beach Towel, H2Go Water bottle, Umbrella, Top Chef Cookbook, and a Flip Video Mino. I might have to regift or perhaps pass along the umbrella and grocery tote since those two items do not really fit in with my style. Nonetheless, I did quite well for checking into one of my favorite eateries on Foursquare. 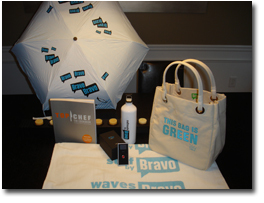 Who knows, you could be the next person to win a Bravo gift bag so don’t forget to check-in at your next venue.